"My aunt gave me this recipe. It is a little trouble, but they will be the best brownies you'll ever eat." Peel caramels and place in a microwave-safe bowl. Stir in 1/2 cup evaporated milk. Heat and stir until all caramels are melted. Preheat oven to 350 degrees F (175 degrees C) Grease a 9x13 inch pan. In a large mixing bowl, mix together cake mix, 1/3 cup evaporated milk, melted butter, and chopped pecans. Place 1/2 of the batter in prepared baking pan. Place the remaining batter into the fridge. Remove brownies from oven and sprinkle chocolate chips on top. Drizzle caramel sauce over chocolate chips. Remove brownie mix from refrigerator. Using a teaspoon, make small balls with the batter and smash flat. 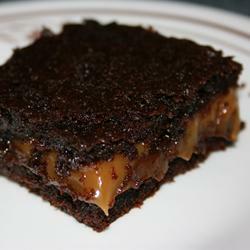 Very carefully, place on top of the caramel sauce until the top is completely covered. Bake for an additional 20 minutes. Remove and let cool.